Getting your home ready for winter and the pests it brings is easy as 1, 2, and 3! 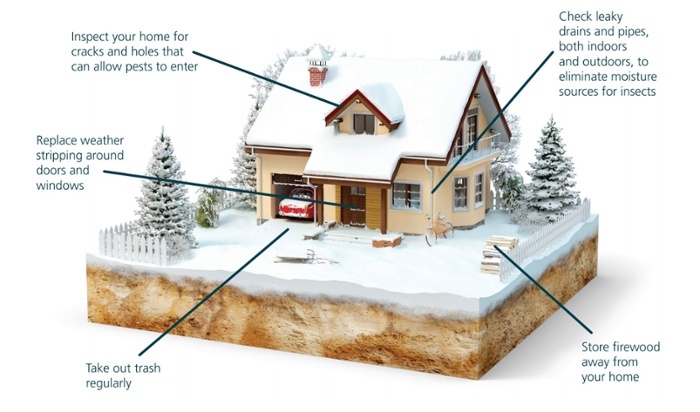 Follow the steps below to winterize your home and reduce those pesky pest problems. Just remember, with so many tiny areas to consider around the home where pests can enter, it may be impossible to tackle every arising pest issue without a trained professional. Contact us for any of the unexpected pest problems you encounter this winter. Pests mainly come indoors looking for suitable shelter, moisture, and food. Check leaky drains and pipes, both indoors and outdoors, to eliminate moisture sources for insects. Also check the drain spout outside to ensure that all water is being drained away from the house, to prevent creating a moisture problem near the home foundation. Inspect the eaves and fascia around the outside of the house for any areas of wood that may have rotted and replace wood that is damaged. Rotted, wet wood is an excellent attractant to many insect pests, especially dreaded termites. During the busy holiday season, food becomes abundant as we celebrate with friends and family. Avoid attracting rodents and other pests by storing foods in sealable containers. For dog food and other dried goods, use plastic or metal bins that seal tightly to prevent pests from chewing through bags or cardboard containers. Simple sanitation practices like taking the garbage out, not leaving dirty dishes in the sink, and vacuuming crumbs will also help keep pests at bay. To prevent insects from entering your home in the first place, it’s important to thoroughly inspect your home and seal any cracks and holes that an insect or other pest can get into. As you inspect your home, look in areas where you see light easily coming in — if you can easily see light, then an insect can most probably enter. Replace any old, worn weather stripping around doors and windows. Be sure that all windows and doors properly close. Seal cracks and crevices with an appropriate sealant or caulking product. Large holes and areas surrounding plumbing and/or utility penetrations should be stuffed with steel wool to prevent rodent entry. Many of these areas will be sealed with foam insulation, which is great for conserving heat; however, rodents are capable of chewing through foam insulation. Inspect and replace any damaged foam insulation, first by stuffing the area with steel wool and then using foam insulation. Nothing makes a cold, snowy day better than a warm fire in the fireplace. However, firewood provides great shelter for a multitude of insects, including wood boring beetles and cockroaches. Firewood should be kept outdoors to prevent bringing pests indoors. Pests inside of firewood warm up when brought inside and then become active inside of your home. Only bring firewood inside your home if you are going to use it soon. If you can’t use all the firewood in one day but won’t be storing it for long, you can keep the wood in a cool garage or on cold concrete elsewhere to prevent insects from warming up and emerging out of the wood. For longer periods of storage, do not store your firewood against your home or beside a building, because this can cause long term problems with ants and termites. Be sure to use the oldest firewood first. The older the firewood is, the more likely it is infested with insects.